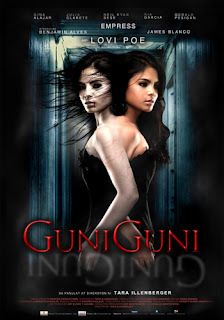 When one by one, the boarders of a boardinghouse in Cubao, die of unexplainable causes, Joanna, the resident psychic, and Mylene's best friend struggles to understand the impending danger that she senses and decides to get to the bottom of the mystery and as it unravels, they find themselves confronted by an angry soul that seeks justice. Guni-Guni is a 2012 Filipino horror film under Regal Entertainment. It stars Lovi Poe and Benjamin Alves. The film is directed by Tara Illenberger.